Sister Sophy believes in a world where people make each other happy. By being happy with each other – especially that. By appreciating each other and showing the appreciation. Such a world looks good and everyone wants to live there. Sister Sophy wants to share this dream with everyone. It is an ideal world that we think is very close cause it takes no more than two people and a bouquet. Inspired by that idea, Sister Sophy wants to provide the most beautiful and fairest bouquets, intended for everyone who wants to make someone else happy. The one who gets, the one who gives and the one who made that possible. Fair is fair; that feels good. Sister Sophy believes that there is still a world to win for organizations that truly value their relationships. Organizations that are not satisfied with a gesture, but who want to give something of value. Fair trade. It’s time for a great gift. Help us to ensure that only fair flowers are available. We want to work towards a point that all bouquets from Sister Sophy are 100% fair, that requires volume. Once we have sufficient volume, we will tackle the chain and ensure that the entire flower chain will be fair. 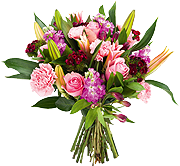 Help us to send fair flowers. Against child labor. For fair trade. For a better environment. For a better earth. For us all. Help us and share Sister Sophy with your colleagues, friends, and family.